Genevieve Flannery is used to her mother, Delia's sudden outbursts and when she starts talking to herself. Geni is also accustomed to the circus life that she and her mother are apart of along with daily workouts of acrobatics. On a day that seems to be like any other performance, something goes horribly wrong and Delia dies during her performance. While still reeling from the tragedy, Geni receives a package from her mother that is filled with more mystery than answers. Suddenly, Geni is also able to see visions into a time that isn't her own. Are the package and Geni's visions related? What was behind Delia's death? I always loved stories about the circus and this one didn't disappoint. I found all the characters to be interesting and relatable but my favorite character was the baby elephant, Houdini. Houdini was definitely a treat to read about and enjoyed every single scene he was in. I am a little disappointed he didn't have more scenes but honestly, it probably wouldn't have added much to the story. I found the novel to be interesting and it had a few surprises. There were a few things I didn't like was that there wasn't much detail about the circus life and the bad guy's identity was outed after a few characters in without much fanfare along with why didn't Delia seek help sooner from same people who help Geni. It was a fun read and would definitely read the second book if the author decided to make this a sequel. 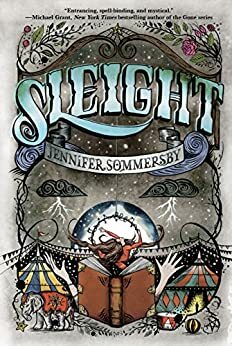 3 winners will receive a SLEIGHT Prize Pack including a finished copy of the book and swag! International.